The region of Beaujolais conjures dynamic imagery. For many, the suggestion of drinking the wines is still met with a “well, if there’s nothing else to drink” response, no doubt influenced by seas of thin, industrial confections being pumped out of it in our all too recent past. And while it’s an opinion held most fervently by the generations which precede my own, one must understand that this was an era of affordable Bordeaux and Burgundy, in which hunting value in the ‘alt’ regions of France was more of an adventure than a necessity. And yet for some, Beaujolais is a site of resistance. It’s a place whose runaway mass marketing image was captured by key growers of the 80’s, and scaled down into the level of the human — specifically the ones whose names were now adorning the labels. From this lens, Beaujolais today is a diaspora of the dejected, fighting bottle after bottle to reclaim their homeland from the standardizing effects of hyper-commercialism. To this camp, Beaujolais is the affordable Burgundy, and it’s no surprise that the last ten years have seen its increasing dissection by those looking to intellectualize their experience of getting to drink it. Both perspectives are reasonable, but the grand irony is how the amplification of these points of view erase one notable narrative from the Beaujolais story: grower-sized quality and terroir specific wines have a much longer history than is often proposed. 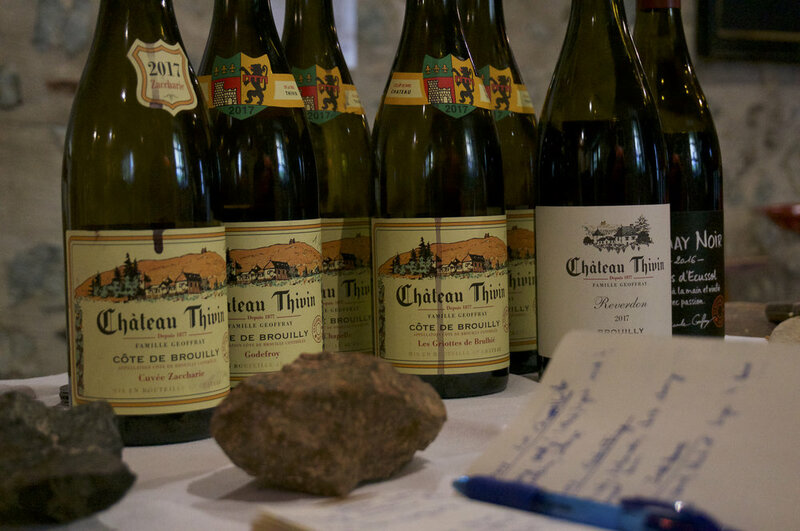 For some, like Château Thivin, this history spans five generations. Perhaps it’s their position, perched on top of the ancient volcano of Mont Brouilly, overlooking the rest of the crus the way a spaceship overlooks the earth, that influences the steady-handed faithfulness one finds in their seemingly timeless wines. It is perhaps unsurprising that a domaine who was chiefly responsible for identifying and creating their home cru of Côte de Brouilly in the 1930’s should be such proud defenders of it now. From the second you enter the driveway, one is immediately given the impression that the audience they most hope to impress are their family members that came before them. The pride that Evelyne Geoffray holds for her family and their domaine are indistinguishable. This is the way she introduced us to her son and vigneron, Claude-Édouard, while taking what appeared to be multiple simultaneous phone calls, bidding farewell to guests of their gîte, and welcoming passing clients and restauranteurs into their doors. Claude-Édouard is young and exacting, explaining their traditional semi-carbonic fermentation and gravity led vinification in a way that makes it all seem elementary. It’s worked for 100+ years, why wouldn’t it be done this way? While Thivin’s methods would widely be considered cru Beaujolais’ industry standard, there are a few key distinctions. First is the obvious distinction of terroir. Thivin is situated on the south face of Mont Brouilly, one of two famous ancient volcanos of Beaujolais (the other being Côte du Py in Morgon.) These sites contain a unique blue granitic soil, distinctly different than the pink granite found scattered amongst the other cru sites, which lends the wines a bright floral lift amidst their much more obviously tannic structure. More unique, however, is that Thivin vinifies all Côte de Brouilly parcels separately, a style more reminiscent of Jean-Louis Chave in Hermitage than with other producers on the mountain. These parcels are blended every year into the domaine’s staple, “Les Sept Vignes”, though small amounts of some key parcels are bottled separately to show the unique nature of each site. As conversations around vineyard labeling and 1er Cru recognition increases in the crus of Beaujolais, it seems Thivin is already 100+ years ahead. A blend of constituent Côte de Brouilly sites. While hail was a factor in 2017, the grapes had no problem ripening. In general, it is a year of darker fruit and more concentration in the wines. There is a spicy, wild berry tone, supported by graceful tannins and soothing liquorice. Flashes of sweet floral notes poke their head up, finishing gracefully into a very complete wine. The most “ready” Côte de Brouilly wine Thivin makes upon release, but you’ll be rewarded for aging this 5-10 years. An entirely south facing exposure (Brulhié being the old name of Brouilly). Coarse, chunky tannins with bass toned red/black cherry fruit and cocoa. Powerful, heady, and dark. From the top of Mont Brouilly, another south facing exposure with up to 50% incline. An enormous pain to pick and plow, but worth it for such a pretty, lifted wine. Light mint, maraschino, and dried floral incense. With it’s higher acidity and bonier tannins, the wine reads harder from this site in youth, and is used to add lift and acidity to Cuvée Zaccharie. La Chapelle hosts some of the older vine material owned by Thivin, and makes a wine that needs plenty of time. Another part of the blend for Cuvée Zaccharie, and another source of very old vines, up to 90 years with full eastern exposure. Mint, granitic intensity, with light balsamic and dark cherry notes that are incredibly long and persistent. The only wine aged in barrique (10% of which is new.) This is blend of Godefroy and La Chapelle, and named in honour of Zaccharie Geoffray, original family founder in 1877. Ripe black fruits with a notable backbone of spice. Dried rose, fresh blackberry, clove, nutmeg, and cinnamon. Noticeably denser than the individual cuvées which comprise it. The first year of their Terra Vitis certification for sustainable agriculture. Smoke, autumn, ripe pressed cherries and iodine. A true vin de garde, and a cheeky wink to those who maintain the blanket opinion that Beaujolais’ wines can’t age (or, for that matter, that wines with semi-carbonic maceration can’t either.) Not show stopping or earth shattering, just entirely noble and pleasant. As a general takeaway, these wines are truly brilliant representations of a more structured and powerful vin de garde style that does not always characterize the current zeitgeist of cru Beaujolais. Placing these wines away for a few years will reward you with a type of quality that is unmatched in relation to price in practically every other region of France. As convincing an argument you’d need for appreciating Thivin’s whites as much as the reds. From 450m elevation on clay/limestone soils. Apricot, lemon oil, and the smallest touch of VA that lets the wine float above its waxy, full texture, attributed through its slow aging in neutral cask. Delicious. Don’t think, just drink. These wines were tasted on October 2nd/2018 at the domaine. Merci Evelyne and Claude-Geoffray.